Back in the 1970's and 1980's when rubber playground surfaces were first used in the UK, members of sportsequip's staff were at the forefront of the industry's development. Pioneers, sitting on trade association and British Standard sub-committees they were the vanguard, establishing what are now accepted as standard industry practices. Today, sportsequip continues to pave the way, with our wet pour specialists able to overlay and rejuvenate old wet pour surfaces, sometimes at a fraction of the cost of a completely new installation. Part of the long standing experience offered by sportsequip is knowledge of what to do when existing wet pour play surfaces appear to have reached the end of their lives. Many companies will advise that existing surfaces have to be ripped up and replaced, with all the inconvenience, associated costs and landfill spoil. That doesn't always need to be the case. At sportsequip we try to help and offer alternative solutions where possible. If you have a worn, cracked, crazed or shrinking surface, providing it is laid on a stable and well constructed sub base it may well be possible to repair, infill or overlay it. It may also be possible to deep clean or to rejuvenate it. Using our tested Compliant Wet Pour™ system materials it is possible to re-create surfaces as good as new. 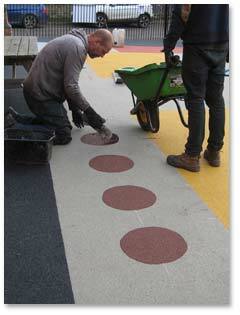 To ring the changes and to make play areas more attractive Compliant wet pour repairs can be carried out using a wide variety of eye-catching colours and incorporating a number of inlaid shapes and designs. Costs for play area resurfacing and refurbishment will depend upon the extent of the works to be carried out. Therefore standard guide prices for these services are not available. To speak about your specific project with one of our experienced wet pour specialists, to arrange for a free no-obligation quote or to simply find out more information about Compliant wet pour please call us on 01858 545789, or email sales@sportsequip.co.uk. Please also refer to the 'Downloads' section of our website which contains a lot of useful information, including wet pour technical data sheets, test certificates, installation and maintenance information. For cost efficient, safe, impact absorbing surface solutions, think sportsequip.